Being a therapeutic parent is hard. It’s wearing. It’s tiring. It’s work. All. The. Time. It’s benefits in the end are rewarding beyond compare, but when you’re in the day to day it can be draining. 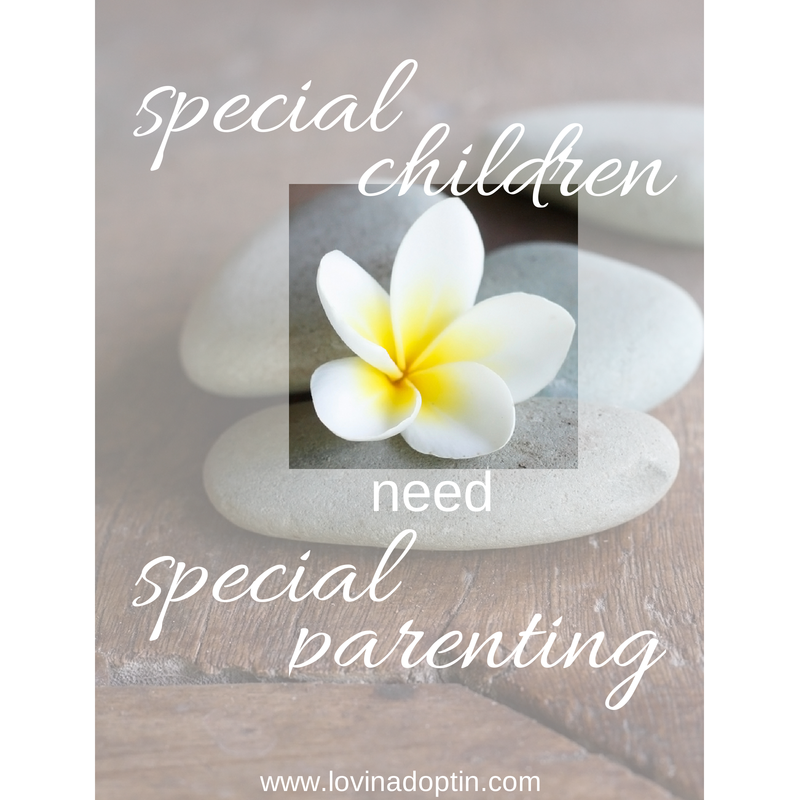 Although my husband and I have come out of the most difficult parts of therapeutic parenting with our daughter, we still have to parent in a different way than a person would with a typical child. We also have an Autistic child, and that takes constant therapeutic parenting and I struggle with health issues, so I’m tired, and you probably are too. Speaking of being tired, my husband, Justin, and I have been staying up way too late this summer. It’s usually midnight or later by the time we get in bed, and we don’t function well when we turn in this late. Often the culprit of our late nights is something needing accomplished around the house, but sometimes it’s simply staying up, just because. We LOVE our kids! They’re our life. (No I don’t know what we’ll do when they grow up! But heck, since my son has nonverbal Autism he may be living with us forever, so I don’t have to worry.) But there is so much going on, there’s a lot of stress in our life and Autism only plays a small part, and when everything’s done at the end of the day, we enjoy sitting down together and reading or watching HGTV or Last Comic Standing on the iPad. Yes, we are boring! Boring is good, boring is relaxing. When I dove into the foster care and adoption world I saw parents who spent so much time away from their hurting kids. Parents who spent a couple hours exercising every morning, took their kids to school, and filled up their afternoons and evenings with events. I knew dads who, when asked to watch the kids, only sat in front of the t.v. watching sports, and on weekends when the family could be together, they went golfing or spent time with the guys. I was furious. Yes, I judged, and maybe part of me still does. When a child is battling with their past, fighting to survive on the inside, they need family. They need attention, they need one-on-one time, and they need considerable amounts of it, so much that it can’t be measured. I hurt for these kids. Children who wouldn’t conform to a families routines (jogging, biking, sports, t.v. time, golf time) were sent off to group homes where they were supposed to be “fixed”. I’m not trying to get into a discussion about whether sending a child to a group home is appropriate, my focus is what parents are pouring themselves into, selfish desires, or their hurting children. I’ve always been reticent to tell parents they need to have “me” time, time for themselves, doing something that fills them up instead of taking away. I’m hesitant to say this because people can take it overboard and do as many parents I’ve witnessed, they can dive into themselves to avoid what’s really going on with their hurting child. They can spend so much time filling themselves that they avoid the needs of their children, not the physical needs, but the emotional connectedness that a traumatized child yearns so desperately for. As a therapeutic parent, you do need to fill your “bucket,” because what you do every day, every moment is wearing. But balance is key, and it’s not so easy to find. I try to find my solace, usually reading a book outside. It’s something I can even enjoy at times when the kids are around. I also love writing, so working on Lovin’ Adoptin’ works in aiding in my “refresh” time, I really don’t consider it work. Justin and I have also focused on having more date nights, it’s hard to do when your life is busy. There used to be so many nights when we would cancel on our babysitter (who we ended up paying for the night just because we felt bad), because of our daughter’s behaviors or I was too exhausted from the day. Those days are fading, especially because Payton’s behavior has improved tremendously, and we have a date night about twice a month. I’ve been there, where I’m so exhausted, not just from health issues, or from working with an Autistic child, but from pouring out love and getting nothing in return. 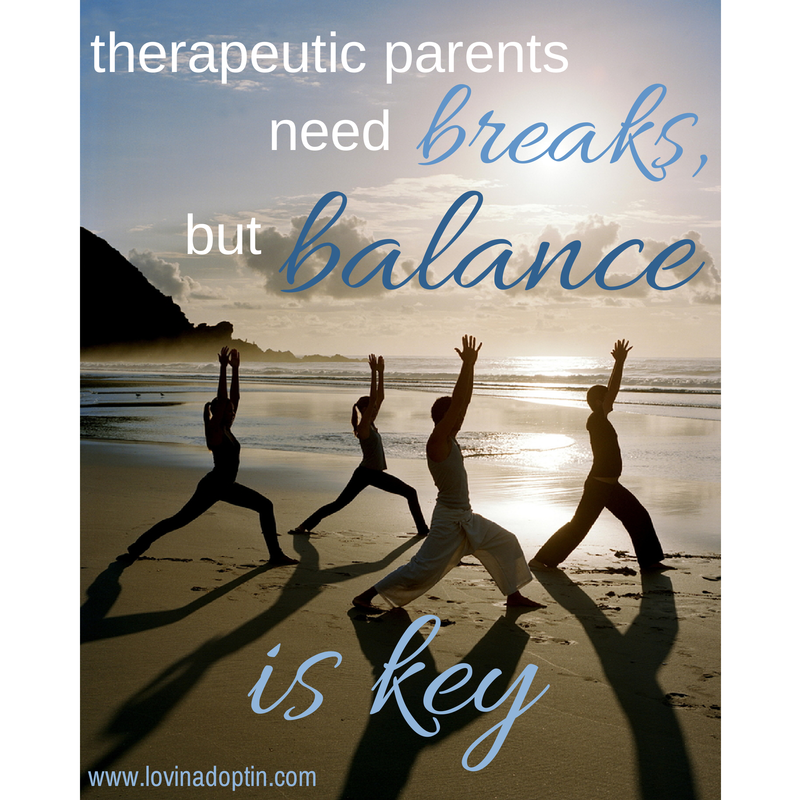 Therapeutic parenting is all-inclusive, it invades every moment of your life, and to be able to fill your child, you need to help yourself. What can you do for yourself that you enjoy? Is there something that would make you feel better? Is it having coffee with a friend who you can talk to openly? Is it working out at the gym or riding your bike? Is it taking an occasional weekend away? Is it simply reading in a favorite spot? Do you find it hard to treat yourself? Do you find that there isn’t enough time? What do you do that doesn’t take away too much time, but fills you up? Maybe some other parents reading here would benefit from your ideas. You can receive every post made to Lovin’ Adoptin’ by subscribing in the upper right corner. If you’re on a mobile device, you can do this on the web version. You can also follow me on Facebook, Twitter, and Pinterest for more helpful information and links. lying is the biggest struggle for many parents. I think the reason many moms and dads are so disgusted by lying is because of their past experiences with lying. Whether it be their parents came down hard on them if they lied, or they were constantly accused of lying when they weren’t, or they’ve faced lying boyfriends, girlfriends, and spouses. It can put a harsh taste in someone’s mouth when so much shame, guilt, and negativity surround an issue, in this case it’s lying. she sees herself reacting in the same manner her parents did. What’s a person to do? They can deal with it, both the feeling they have toward their parents and those they feel about themselves. But, most of the time it’s passed on and they do the same with their children if they aren’t particularly careful to avoid those emotions of shame, guilt, and being unworthy. Once we acknowledge that we may have issues with lying that are being transferred to our children, or simply making the issues bigger than they are, we can move forward to understand and help our kids. Think through the situations when your child has lied. Can you connect it in any way to fear? Remembering what Post said about fear of rejection, fear of being caught, fear of abandonment, the fear of abuse. Remember too, our children had another life before they came to us. 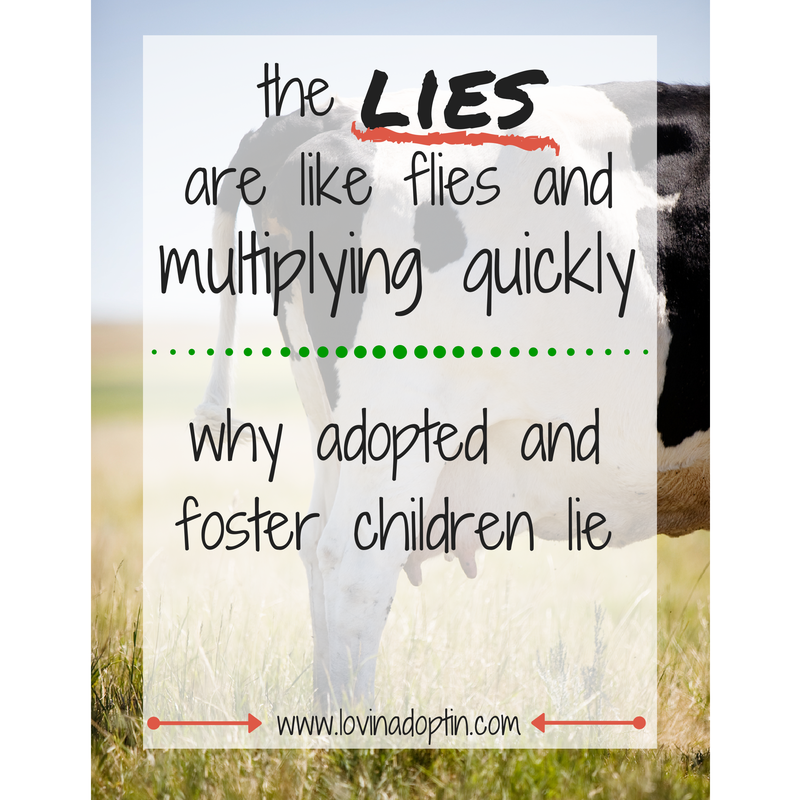 We don’t know how honesty was treated in their previous home or how lying was dealt with. It can be tempting to come down harder on a child who won’t fall in line, which in turn makes the lying worse. If there are issues with lying, it can be helpful to focus on less consequences (or none) when your child tells the TRUTH. Younger children may not always have a fear base for telling a lie, they’re simply testing boundaries and rules. They’ve discovered this idea of trying to fool the adults and they’ll test it to see if it works. I hope you can see how your child doesn’t lie because they don’t like you or they’re a horrible kid. 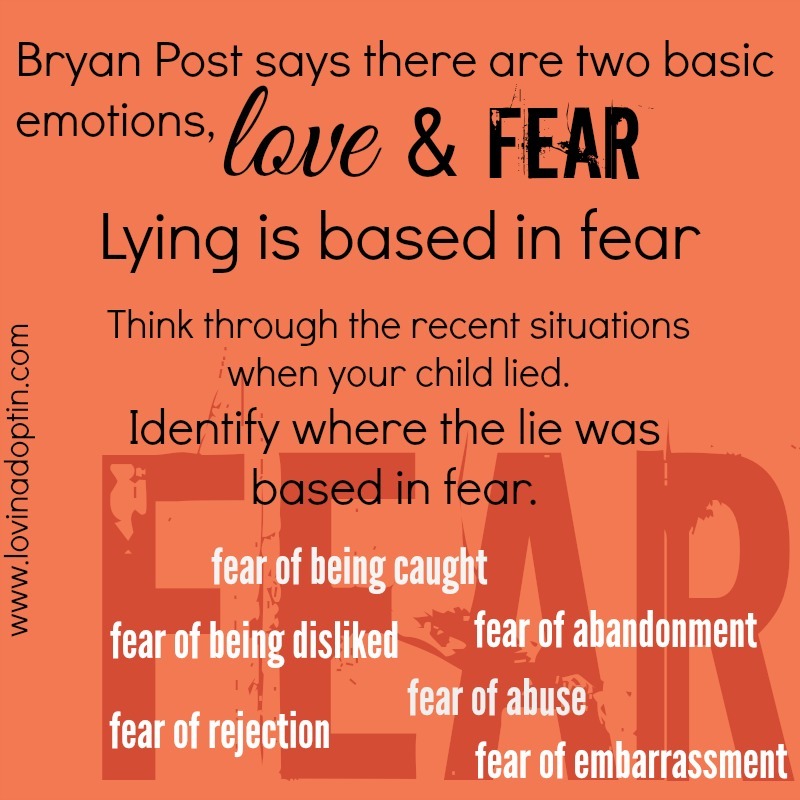 Your child lies because of fear, and young kids sometimes do because they’re testing life. No fun, but it makes it much easier to deal with. If you can stay calm and without much reaction to the lie, they can learn to trust you. What do you think about the relation between lying and fear? Have you dealt with lying in an unconventional way? What did you do and how did it work? **Pam Parish’s book, Ready or Not, is out and available. It’s a pivotal book that I highly recommend foster and adoptive parents read. Have you ever received a hug from someone and felt better afterwards? Have you ever been one to dole out a hug and feel the hugee relax in your arms? There’s something about a hug that changes our chemistry. Hugs calm us. If you’ve ever felt stressed when you were embraced by someone, it’s possible that anxiety lessened. This is especially true if you have a connection with the person giving the hug. There are times when I’ve been hugged during a tumultuous time and that hug made everything that was overwhelming me seem less important. Hugs create feelings of acceptance. When you embrace someone it usually means you like them. (Okay, there are exceptions, but it’s generally the rule.) Our hurting children deal with intense feelings of rejection. Even when they join a family who loves them dearly, they wonder constantly if they’ll be accepted. Do they like who I am? Do they think I’m dirty, because my last foster home didn’t let me wear deodorant? I look different than them, they can’t possibly love me like their other children. The questions continue and expand. When we hug our children (begin appropriately, because you don’t know your child’s complete history), we are showing them we accept who they are and love them. We hold nothing back when we hug someone. It’s complete acceptance. Hugs make us feel safe. When you put your arms around your child they feel safe. They may not recognize it at first, but eventually they will recognize that you’ll keep them out of harms way. When we went to our only counseling session with Payton, the therapist saw how she hugged me and she made a declaration, “See how she’s hugging you. She’s placing her arms above yours (I was sitting, Payton was standing), which means she thinks she’s in control of the relationship.” When you hug someone next time, notice where their arms are. I wouldn’t say what this therapist said is true 100% of the time, but often it is. When we place our arms around a child (usually above their arms), it communicates that we are taking care of them. When we hug a friend, it’s kind of like a figure eight, 50/50, one arm above, one arm below. If a husband is hugging a wife, his arms are usually on top, not in a controlling way (or I hope not), but in a protective way. We want our children to feel safe, so we hug them, showing them we will protect them. For children with Autism, their world may be spinning because of sensory issues, a hug may center them and make them feel safe. If they’re in a new environment they may feel more secure with you close by. Just because a child with Autism doesn’t seem like they care about your proximity, they do. Of course, there are some Autistic kids who don’t want to be hugged. In that case you can put your arm around their shoulder, try different approaches to see what works. Never stop trying. One month your child may hate hugs, the next they may accept them and want more. Hugs encourage. Even the strongest individual, whether it be a hurting child or mature adult, when confronted with daunting circumstances, can be greatly encourage by the simple gesture of an arm around the shoulders. It communicates on a neurological and emotional level, it truly is going to be okay, and even if it isn’t, they’re going to be okay. A hug makes us feel like we can do it. Have you ever felt better after a hug? 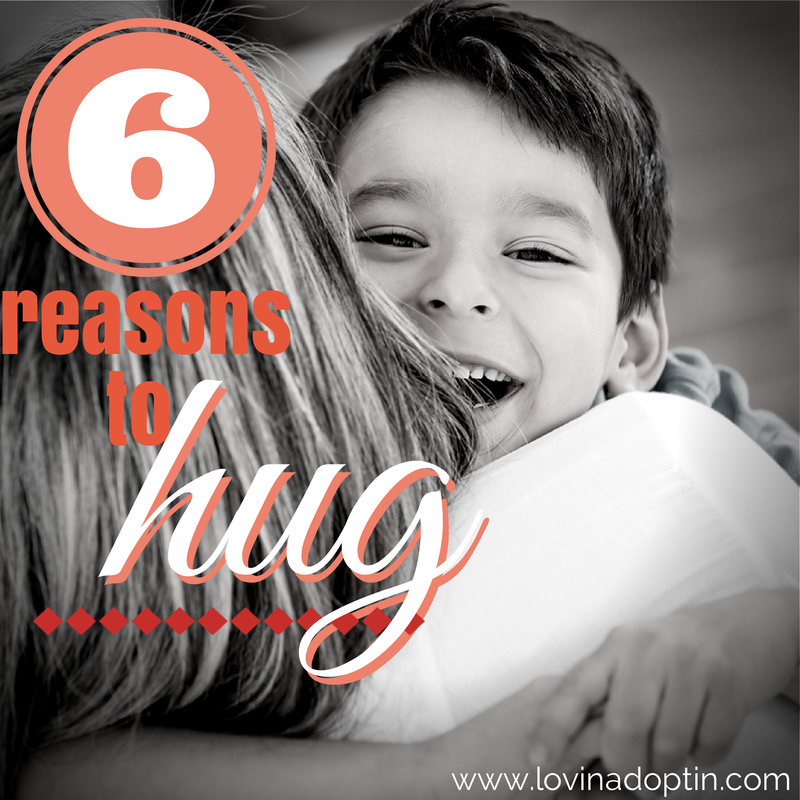 When you’ve hugged your child have you ever seen it make a difference in their demeanor? Hug your children today. Hug your spouse today. Hug a friend today. You can receive every post made to Lovin’ Adoptin’ by subscribing in the upper right corner. If you’re on a mobile device, you can do this on the web version. You can also follow me on Facebook, Twitter, and Pinterest for more helpful information and links. Have a great day! Risa’s daughter, Ashley, screamed every time she said, “Sit down.” It didn’t matter if it was dinner time, snack time, bed time, or movie time, Ashley broke down. The question could be asked, is this simply defiance? If it’s in several areas, it could be, but if a child’s experienced trauma, their behavior won’t fall in line as some would expect. There will be defiance from a traumatized child. In Ashely’s case, the breakdown usually takes place when certain statements are made, like, “Sit down.” If Ashely were able to define how she’s feeling, Risa could ask her what’s going on. Chances are she’s done this, and she’s not getting a response. There a few reasons for this. Either Ashley’s too young to verbalize how she feels or she can’t put it in words because she doesn’t understand. Or, she has repressed the memories that are triggering the fear of the words, “sit down.” Or, those memories are too frightening and she does everything she can to bury them, therefore she’s not able to talk about them. It’s impossible to know everything that happened to our children before they came to us. We don’t know if they were with their birth mother at all times, if all of the workers in the orphanage were kind, if Grandpa yelled, if their birth father was abusive, if their mother left them with strangers. So, we don’t know what happened to Ashely before she arrived at Risa’s home. Maybe someone screamed, “Sit down!” before they abused her. Maybe those words surrounded something that happened to her brother. Maybe those words are the culmination of all the fear she experienced in her former home. If your child is responding similar to Ashley, there are some steps you can take to help them work through this fear. 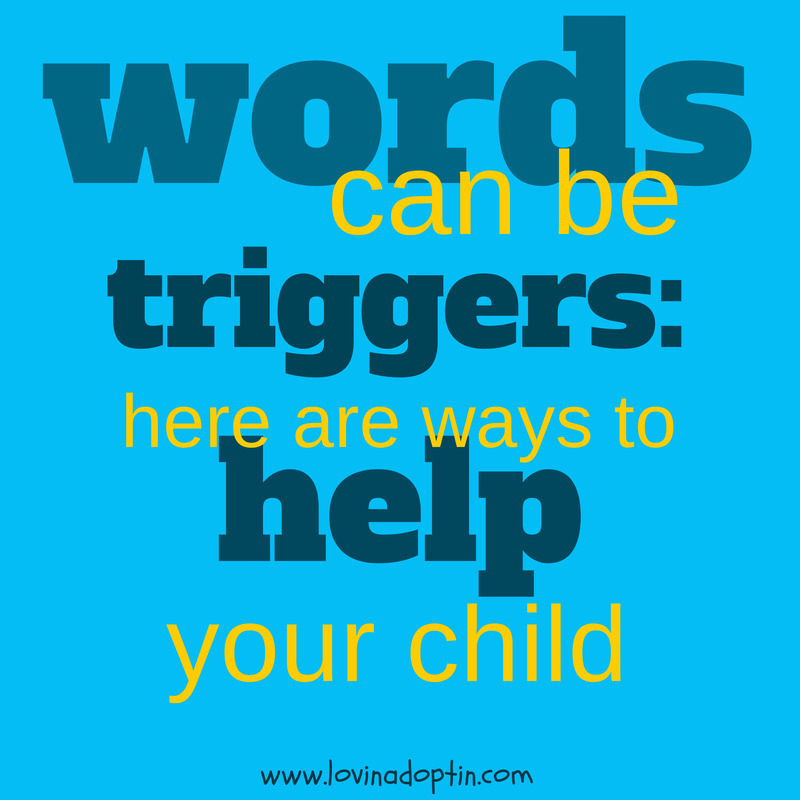 First, use other directives instead of those trigger words. Risa knows that the words, “sit down” create fear. Whether Ashley shows fear in her face when they’re said or not, something is brought up in her mind that causes anxiety in her. We don’t want Ashley to feel this way, we want to build trust, so Risa would use other words like, “Have a seat,” “It’s time to eat,” or, “Pop a squat.” Whichever works. Second, try to find out what happened to trigger that fear response. Above I listed a few reasons why Ashely may not be able to express her feelings. Maybe your child is doing the same as Ashely, so here are links to some posts that will help you create trust with your child so they can open up to you. Third, remember that your child’s been through trauma, whether they’re an infant, a toddler who lived in a foster home in a foreign country, a child who was “well taken care of” in an orphanage, or a child who had great foster parents before joining your family. All of these children have been removed from their birth mom or birth family, all of them experienced trauma. And with all of them, we don’t know the WHOLE story. Although we don’t know the whole story and need to have compassion, we still need to have expectations and consistency. Ashley has a meltdown each time Risa asks her to do something. Notice, Risa isn’t supposed to say, “You don’t need to sit to eat dinner, you can walk around and do whatever you want.” She still has expectations. These expectations need to fit reasonably within what your child can actually do, but they need to be present. Risa also needs to be consistent by following through with what she says. Does your child break down at certain times? Have you been able to nail down the cause? 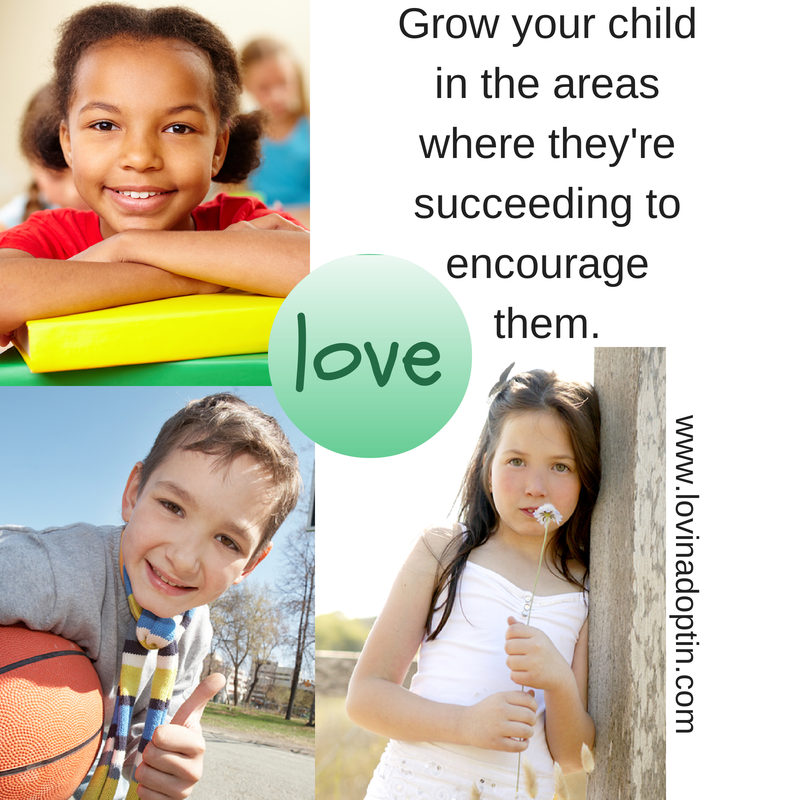 Do these tips help you make a plan to reach your child and reduce anxiety? I love comments, so please share your thoughts. I hope to see you next week. You can receive every post made to Lovin’ Adoptin’ by subscribing in the upper right corner. You can also follow me on Facebook, Twitter, and Pinterest for more helpful information and links. Feel free to share this with anyone who would benefit. Have a great day! Evan lay in his room, screaming and pounding his fists on the floor, his feet slammed against his door. His mom, Talia, looked out the window, sure her neighbors could hear everything and imagined what they were thinking. She couldn’t believe he was behaving this way, he was eight-years-old and acting worse than a toddler, the rages were catastrophic. Evan joined their family through adoption nine months ago and she’d expected him to grow out of this stage, especially with the constant love they all showed him, the toys, bed, nice room, good food, sport activities, and so much more. Hadn’t he bonded yet? Why was it all taking so long? Evan did well in school, he’d caught up so quickly because they’d worked with him. There were battles with that too, but nothing like these setbacks when Evan didn’t feel he was in charge. Talia was noticing the gap between Evan’s emotional age and his chronological age. Because of trauma, your child’s age will not determine their abilities in any area. If a child is six-years-old, you can’t expect their emotional state to be equal to their age. You may have behaviors that range from infantile to age appropriate. 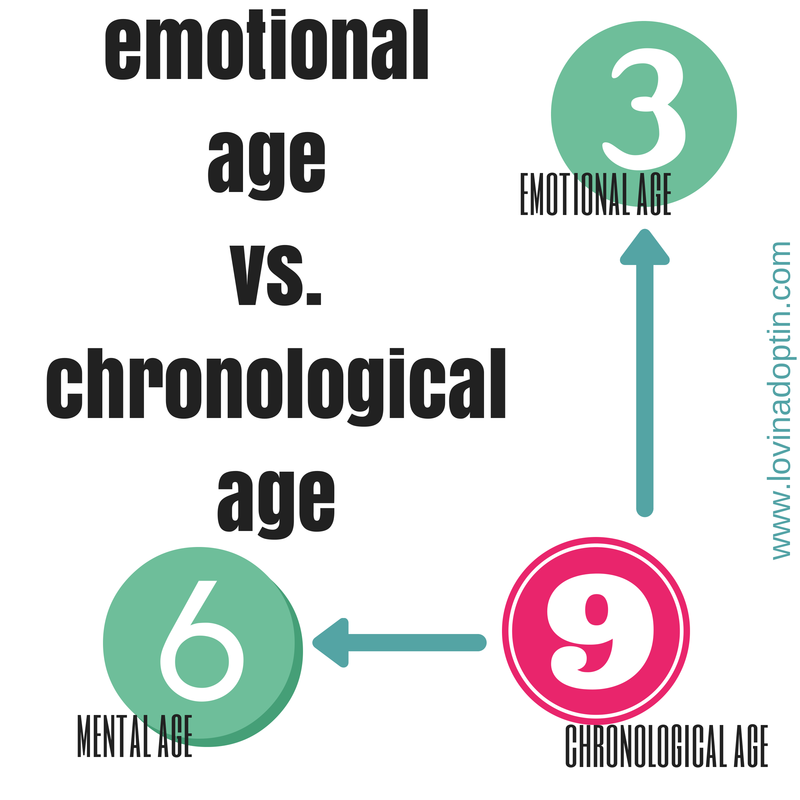 Even though there are gaps between your child’s emotional, mental, physical, and chronological age, you can still meet them where they are in each area. Your child may be very smart and able to do seventh grade algebra at age ten, so meet him where he is academically. His emotional state may not be that of a ten-year-old, but that doesn’t mean you can’t give him educational opportunities. Your ten-year-old may exhibit behaviors of a three-year-old, so emotionally you would meet him where he needs it. You can hold him and rock him to help meet his need at that three-year-old level. Meeting your child where they are can be done through Floortime, which is explained further at The Greenspan Floortime Approach. “Floortime meets children where they are and builds upon their strengths and abilities through interacting and creating a warm relationship. It challenges them to go further and to develop who they are…” I love every point in this statement about Floortime. In my post, Let’s Bond Already – Creating Attachment with an Adopted Child, I explain each of these points in more detail and give ideas on how to use this technique with older children. you’ll see the gap between the two begin to close. Your child may always be more attuned to their world than a typical child, they may be able to tell you how to get across town to your friend’s house, or surprise you with their ability to recall events. This is because they were forced to protect themselves and possibly siblings when they were with their bio family. Their brain was catapulted into survival mode, and it’s possible part of it will always be there, overly conscious of their world. It’ll subside quite a bit as they move farther from the trauma, and are cared for by loving parents, but you can view this as something that will benefit them in the future. As your child heals, they will have times of regression. Triggers will send them back to what they experienced before joining your family. Triggers are moments, experiences, memories, or events that remind them of a part of their traumatic experience. Your child will also exhibit negative behaviors and emotional regression when they feel out of control, which reminds them of their past. In Dr. Bruce Perry’s book he shares the story of Sandy who witnessed her mother’s murder. When Sandy went to her foster home, she would loss it completely at certain times during the day. It took the family a while to figure out what the trigger was, but finally, after paying very close attention, they found Sandy had a meltdown every time she saw milk. The milk was a trigger because when her mother lay on the floor after being stabbed, Sandy tried giving her milk. That wasn’t the only trigger for her, but it gives you an idea of why our hurting children regress and in turn their emotional state deteriorates. A child who experiences trauma such as Sandy did may be able to communicate well, and function fairly well within the family, but her emotional state will be compromised greatly when a trigger presents itself. She may start blubbering, not be understood, unable to communicate any feelings or thoughts. Time + Time + Time: This talks about how quickly someone can tear down a child, and how long it takes to build them back up. Remembering what your child went through can help you make it through those difficult times. Is Love Enough: Is love enough to help a hurting child? It depends on what your definition of love is and what you’re willing to do. Attachment in Adoption, the First Things we Need to Know: Explains attachment issues and Reactive Attachment Disorder. There are links at the bottom of this post to other helpful posts on attachment and how to help you bond with your child. Let’s Bond Already – Creating Attachment with an Adopted Child: Explains Floortime and gives tangible examples of how to work on bonding with your child. You can receive each post made to Lovin’ Adoptin’ by subscribing in the upper right corner. You can also follow me on Facebook and Twitter for more helpful information and links. Our daughter, Payton, came to us through foster care. Her bio mom, Susan* was homeless most of the time Payton was in our care. Part of Susan’s parenting plan (set of requirements she had to fulfill before getting custody of Payton) was that she gain safe housing, a job, write a letter to Payton, and show in supervised visits that she could care for Payton. She wasn’t able to complete any of these requirements. Towards the end of Payton’s time in foster care we sat down with case workers and made a plan for future contact with Payton’s bio family. In her case it included extended family members as well as her birth mom. Because Susan hadn’t been able to stay in one place, the case workers set it up so that we would correspond with Payton’s bio aunt Jana* through the Department. We agreed (as did they) to send letters and pictures twice a year to the Department of Human Services (DHS) and DHS would then forward those to the aunt, Jana, who would share them with the birth mom, Susan. The bio family was also welcome to send gifts to Payton whenever they wanted. We heard from Payton’s bio family on her first birthday after her adoption. The family included a photo, gift, and card, in which her cousins wrote, “I hope you have toys to play with.” I kinda felt like taking a picture of Payton’s room and sending it to them. Her bio mom had included a short note in the card. We didn’t hear from them again for three years. Yeah, three years! I had been sending photos and letters (although I’ll admit I would sometimes go a few months off the target date). Then in January of 2013 I got a call from Payton’s post adoption worker, Marge*, who I barely have any contact with. She said another case worker came to her, saying she was Payton’s bio aunt and she had a gift for Payton. WOW! So, Jana had got a job at DHS working on children’s cases. For those of you who are looking into doing foster care, please don’t let this deter you, this is an extremely odd case. When Marge called, she was at work and whispering over the phone. It was weird, and I felt very unsettled. Jana knew our names, which had been intentionally kept private through the process and afterwards (hence the reason why correspondence was done through DHS), and knew Marge was our post adoption worker. More unsettling. A little backstory. When Payton was place in foster care (she was in five homes, including one failed attempt at placing her back with bio mom within her first nine months of life) this bio aunt, Jana, had been contacted and asked if she wanted to take Payton. She declined, she was pregnant and couldn’t do it. Of course Jana wasn’t happy about the decision, and when she showed up, knowing our names, and talking about us at DHS I was shocked, and worried. I was put on edge and looking around every corner, wondering if someone was going to show up and try to take Payton. Unfounded fear, but it was there. Marge called again from her cell after work and asked if she could bring the present Jana had left with her. I said she could. Marge was floored that Jana knew our names, who she was, and felt it wasn’t right that Jana had approached her the way she did. Because there was so much trauma prior to Payton coming into foster care and then through the time DHS worked on reunification, we chose not to tell her where the gift came from, nor the cards and pictures. (Her diagnoses are listed below.) It ended up being a good thing we didn’t because there were three years between the correspondence. In the end it would have caused more trauma for Payton if she’d known. When Marge brought the gifts in January 2013 she said that bio mom had another baby. The baby had just turned one. This just might have something to do with the reason the family was reaching out to Payton. But, I wish it wasn’t only because of the arrival of another baby that has a birthday very close to my daughters. In those years when we didn’t hear from the bio family, there was some relief for me. When your child has PTSD, what was diagnosed as Reactive Attachment Disorder (you can read about that here), Oppositional Defiance Disorder, and a mood disorder, all because of her former life, it’s scary to keep that door open. At least for us. It was even scarier and upsetting when the door had been closed (their choice) and they opened it again. Lots of emotions circled, and circled that January right before Payton’s birthday (January 31). Not something I wanted to deal with days before my daughter’s fifth birthday. When I opened the cards from the bio aunt, Jana, I was put at ease a little. The fear about her showing up faded quickly with the words she wrote, it conveyed that she wanted the best for Payton and she knew she was with a good family who cared about her. She gave me her phone number in case I ever had any questions about their family. She was kind. The note from Payton’s birth mom, Susan, was short and nice, telling Payton about her new bio sister. But, what if Payton had contact with them before? What happens when they drop off into oblivion? How does the hurting child feel? Those memories of neglect come back. Those feelings of not being important come roaring in. This year I was certain we would receive another gift and card from them. We didn’t. It’s now May, and it’s been sixteen months since we’ve heard from Payton’s bio family. 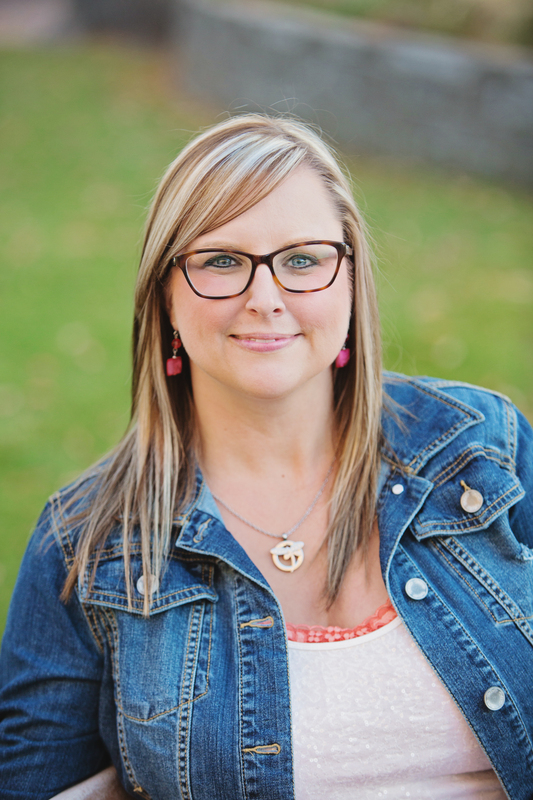 My husband happened to run into Payton’s birth mom, Susan, at the grocery store last week as I was working on these posts about birth families. It’s the first time we’ve seen her outside of DHS in 2009. She now lives in our area, and had her daughter with her. Susan called out to Justin in the store, and they chatted. I was concerned about how her and her daughter were doing, but Justin said both looked good. I’m really glad. 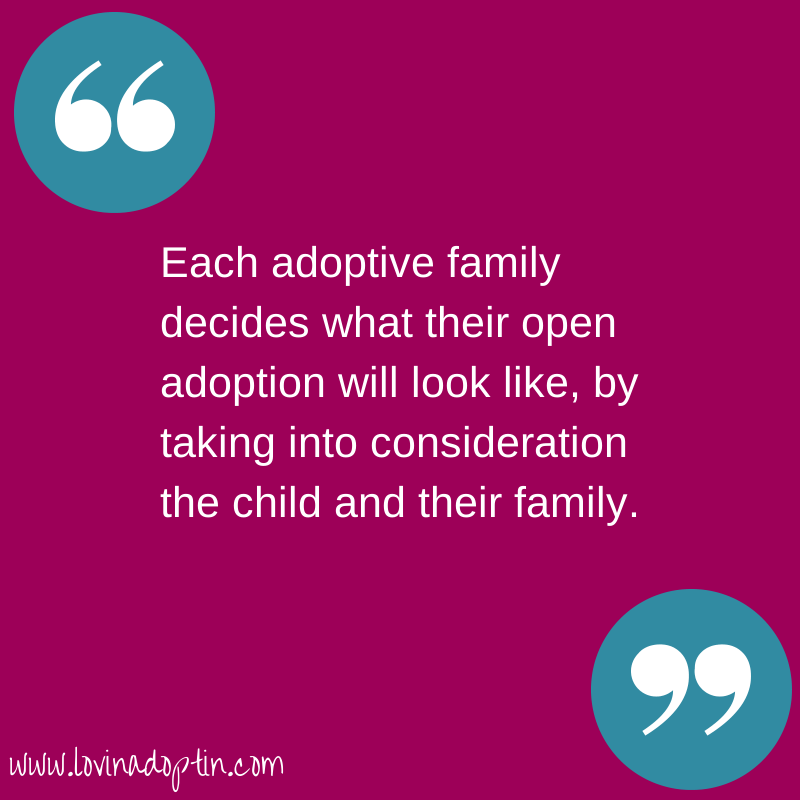 Each adoptive family makes their own choices as to what the openness will look like. 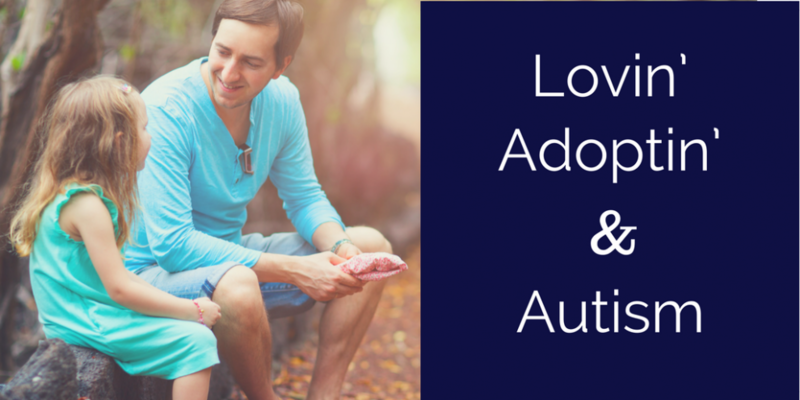 Your open adoption may not look like your friends and that’s okay. Ours is a story of how there can be ups and downs in open adoption, but that you always need to take into consideration your child and your family. I replied that I’m not her cousin, but I hope that what I’ve written helps her. I share this because this is why I write, to help families thrive, I don’t just want them to simply survive. Nor do I want families broken because they don’t feel they can handle their children’s behaviors and attitudes. It’s so exciting when someone shares what they read here and in turn it helps another family, bringing joy, peace, connectedness to what was only strife before. 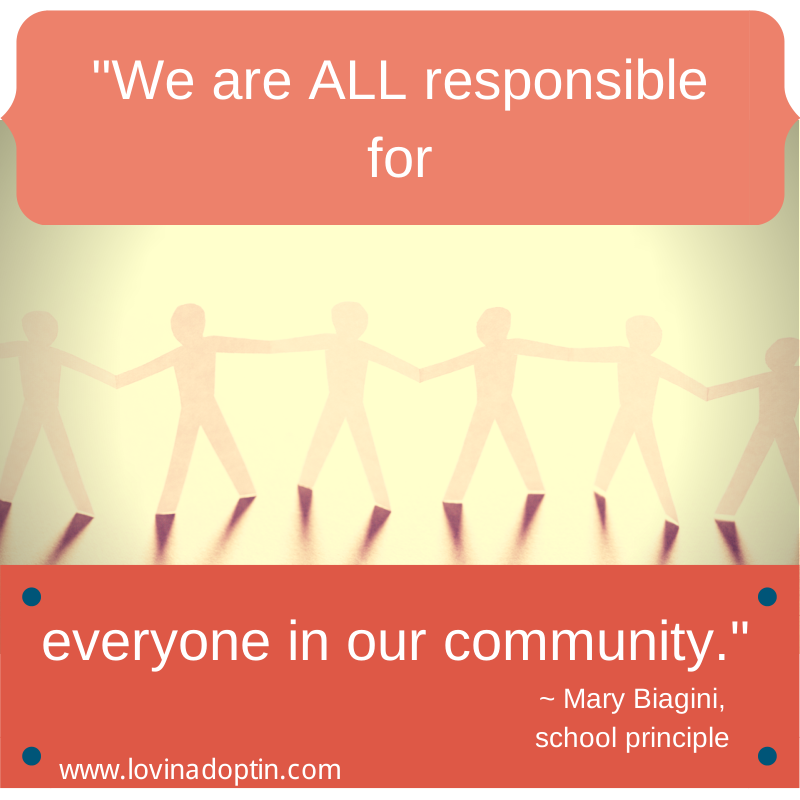 I encourage you to share with others what you feel is helpful here. It’s wonderful when people can support each other and make life better.